The Bosch WFVC544CUC is a 500 series front load washer that comes with 4.4. cu. ft. capacity and measures 27 inches wide. Equipped with EcoSmart sensors and AquaStop leak protection system, the NSF-certified washer has up to 15 wash cycles to choose from and other essential features that are designed to deliver efficient washing performance. EcoSmart Technology provides a highly efficient washing system through sensors. EcoAction lets you save up to 20% of energy. Energy Star certification ensures energy efficiency. The 15 wash cycles allow you to customize each wash for different articles of clothing. The Stain Removal option helps lift stain and dirt in just one cycle. The AVS Anit-Vibration System keeps the noise level at a minimum. The AquaStop leak protection system prevents leak and water damage. NSF certification means that the washer can eliminated up to 99.9% of bacteria on clothes. The unit comes in a sleek design in sepia color, with stainless steel drum, silver buttons, and LED display. The stackable washer allows you to save on floor space, especially when paired with a dryer. 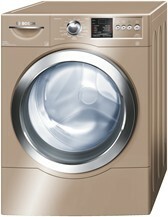 This front load washer operates smoothly and quietly. There are no thumps in the drum and annoying vibration that runs throughout the washing cycle for other washers. Some consumers also noticed how the unit runs with less water compared to other washing machines, not to mention that it is certified as an energy-saver, especially when using the option for EcoAction. The 15 wash cycles are also very effective when washing clothes with different types of fabric. It is easy to wash bulky items such as comforters and towels using the comforter cycle. When jeans are washed, they don't fade, shrink, or come out wrinkled. There are also no trace of detergent, especially when using the allergy rinse option. It is gentle on baby clothes and other delicates, with special options for these articles of clothing. The Bosch WFVC544CUC also has a very sleek and modern design, with stainless steel drum to ensure durability, silver buttons that are easy to use, and LED display for status indicator. It can thoroughly wash clothes with a max speed of 1,150 rpm. Some consumers find its more than $1,000 price tag a bit expensive. Some front load washers with almost the same features and design are sold at a cheaper price. Some have also reported trouble with installation, especially with the bolts. Some stains are also hard to remove, and the unit doesn't offer a prewash option, which could have been helpful.